Recovery work needs to become a vital part of your training and will help to counter the effects of post workout soreness and improve your abilities as an athlete. This method relies on performing low-intensity aerobic exercise. The increase in blood flow has a proven effect on reducing muscle soreness. This may take the form of jogging, cycling or swimming, and try to keep a steady consistent pace over a prolonged period of time. Massage increases blood flow to muscles and helps to remove any build up of lactate. A good massage can often be more effective at hitting awkward spots. While expensive, a decent physiotherapist or massage therapist can make a big difference. Our blood vessels constrict in the cold and dilate in the heat. Alternating between hot and cold acts as a pump flushing blood through the muscles, promoting clearance. Hot / cold showers will stimulate this effect. Or try swimming in a local outdoor pool, river or lake. The exposure to the cold water will also have the additional effects of lowering blood pressure, stimulating the release of endorphins, burning fat and strengthening your immune system. Ice baths have the added benefit of hydrostatic pressure. The external pressure of water, added with the cold, forces blood and metabolites out of the extremities. Yoga, stretching and mobility work are all highly effective ways to counter post-workout muscle soreness. Try to make mobility work a regular habit. Even just five minutes a day will set you on the path to becoming a much better athlete with stronger movement patterns and improved flexibility. You can always increase this if time allows. 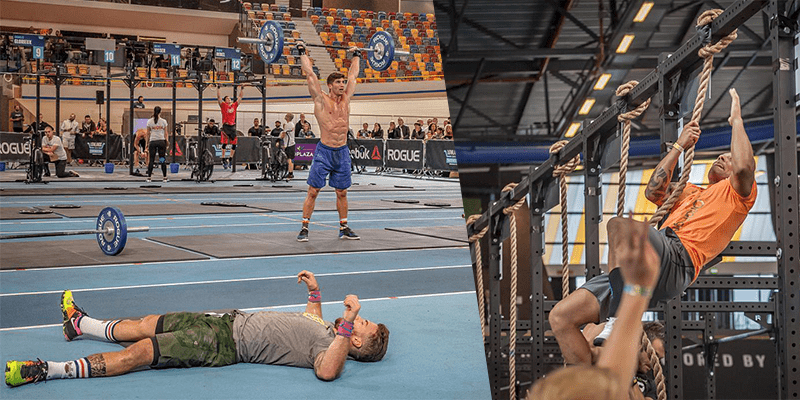 It is worth taking into consideration that many of the top Crossfit athletes will often perform around half an hours worth of recovery / mobility work for every hour they spend training. That’s a tough ratio to match, but here I reference it as an indication of how important it is if you want to perform well and lessen the effects of post workout soreness. Prevention is often the best cure. If your warm up is inadequate then you will not perform as well as you could in your workout. This in turn increases the risk of injury and likelihood of post workout soreness. 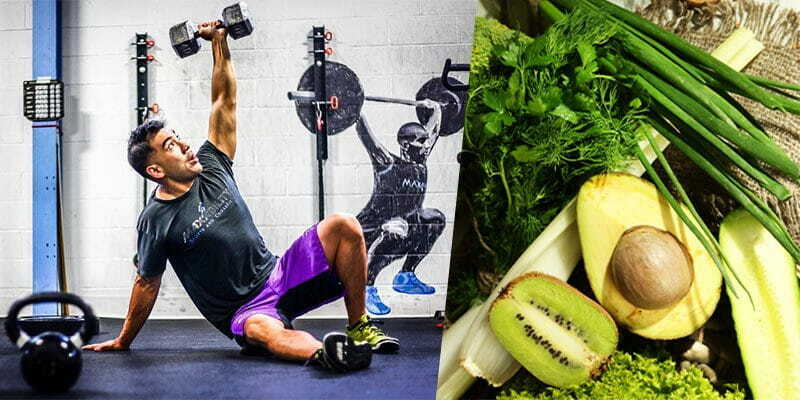 When talking about recovery and reducing post workout soreness, it is impossible not to mention nutrition. Below is a quick introduction to outline the basics, but click the link below to check out our extensive archive of information on nutrition. 1. Protein is essential for the repair of cells that have been damaged during intense training. The repair of these cells makes our muscles bigger and stronger. Most of us could benefit from increasing our intake of lean protein. Serious athletes should consult a qualified dietician to ensure they consume adequate protein within their diet. 2. carbohydrate: When we train at high intensity we rapidly deplete glycogen stored in the muscle. This is the fuel we need to perform. Consume quality carbohydrate as soon as possible after training. During the post workout period we make better use of carbohydrate as our muscles want to replace glycogen. Glucose is absorbed easier during this period, preventing it being stored as fat. The amount needed depends largely on duration and intensity of the training. 3. Vitamins and minerals: They are essential for the proper functioning of our cells and muscles. It is vital that we eat a balanced healthy diet with healthy fats and supplement with a good multivitamin. This ensures that the greater needs of repairing cells are met, allowing them to restore themselves fully. 4. Hydration is extremely important. When we sweat we lose water. Water is the main constituent of blood; when hydration is poor we have a reduced blood volume. Blood volume is a key factor in determining aerobic capacity and performance. Maintaining good hydration ensures our cardiovascular system is functioning at maximum capacity. As our body is made mostly of water, good hydration will also contribute to the repair and growth of cells. Monitor urine to ensure a light lemonade colour is maintained.